I was lucky enough to be part of the second cohort of Target Inquiry teachers at Grand Valley State University. As part of the program, we each wrote, tested and revised two chemistry laboratories for use at the high school level. One of mine is the lab I am sharing here. I chose the topic because if I had to identify something I was not confident teaching about, it would have been electrochemistry. I learned a lot researching the topic, previously written activities and misconceptions related to the topic. Students proceed through a prior knowledge activity, practice creating and using a voltaic cell and use of a model designed to simulate the particulate level activity within a voltaic cell. The teacher checks for student understanding at specific points as groups work together. A discussion follows to help clarify ideas. Students move the pieces on the model. The student will draw and label the parts of an electrochemical cell. The student will identify and explain the reactions occurring at the anode and cathode. The student will explain the flow of electrons in relation to the cell and the resulting voltage. The student will explain the movement of cations and anions in the cell. About one 60 minute class period for lab and manipulative procedure. Voltaic Cell Kit OR you can set up a cell using a 400 mL beaker, a porous cup and alligator clip wires. Current is believed to always involve movement of electrons, even in solution and through the salt bridge. In an electrochemical cell, anions and cations move either until their concentration in both half-cells is equal or until one half-cell is strongly negatively charged and the other is strongly positively charged. A lack of understanding of the significance of the signs of the anode and the cathode and what happens to these signs when changing from an electrochemical to an electrolytic cell. Part A: Students may use a Voltaic Cell Kit or beakers per Figure 1. Lab Pros with Voltage probes may be used. If you have trouble seeing a mass change within the lab, keep one cell running for a longer time period until you can see that the electrodes have changed in size and show to students. Note: Notice that both half reactions from the Prior Knowledge Section are present. They are separated so that there can be no direct interaction between zinc atoms and Cu2+ ions. The porous cup keeps the Cu2+ ions from coming into contact with the zinc strip. Part B: Check to make sure students have set up the model per the diagram provided before they work through the procedure. While students work through the model, check for understanding of each group. Get students to say that the Zn2+ goes into solution. Ask them what happens at this point to keep the charge within each cell neutral. What happens at the cathode with the electron? Have students explain the electron flow, ion flow through the semi-permeable membrane, and cation/ anion change at the electrodes. Initial Check Point at end of Part B. Part C: Students should observe the electrode. The mass of the zinc electrode should decrease and the mass of the copper electrode should increase. The zinc electrode may seem dull because it is losing zinc atoms. 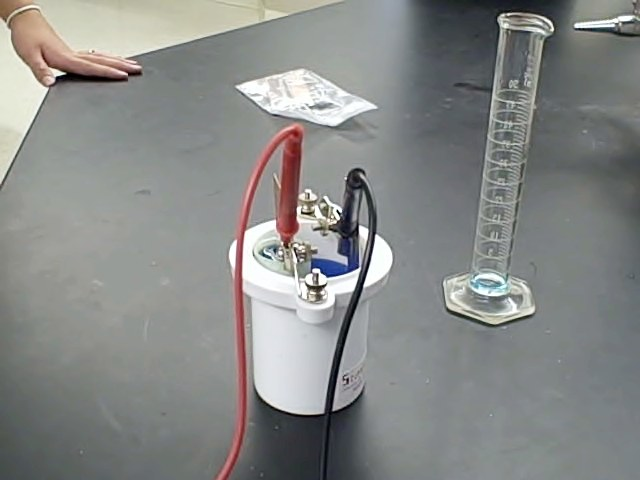 The copper electrode may look shiny because it is gaining copper atoms. See attached Student Version for Complete Procedure. See the attached Student Version for associated questions. Prep cupric sulfate and zinc sulfate solutions. Set up voltaic cell kits or alternative equipment. The model in this lab is adapted from the following article: Huddle, Penelope Ann and White, Margaret Dawn. Using a Teaching Model to Correct Known Misconceptions in Electrochemistry, <i>Journal of Chemical Education</i>, <strong>2000</strong>, <em>77 (1)</em>, p. 104- 110. Research related to the activity is discussed in the following article: Cullen, Deanna M. and Pentecost, A. 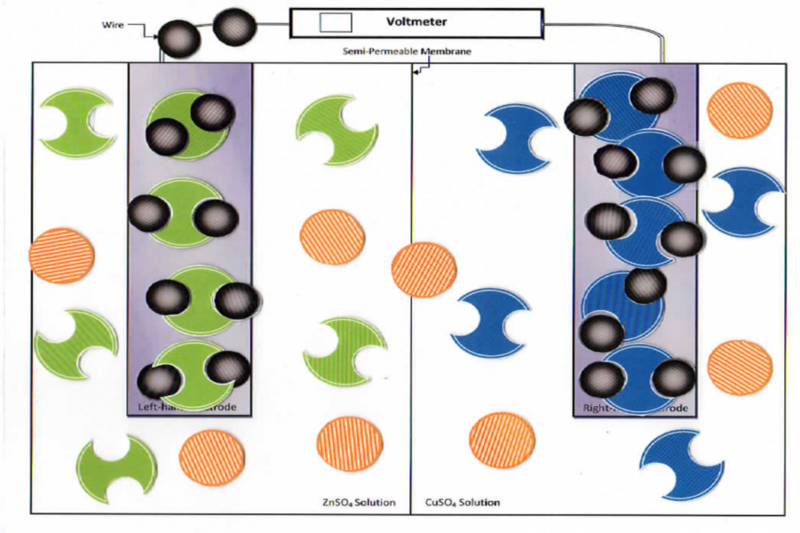 Model Approach to the Electrochemical Cell: An Inquiry Activity, <i>Journal of Chemical Education</i> <strong>2011</strong> <em>88 (11)</em>, 1562-1564. I created this inquiry activity as part of a program called Target Inquiry at Grand Valley State University in Michigan between 2008 and 2010. Thanks to the Target Inquiry Team for allowing JCE ChemEdX to post my activity here. Please see the Target Inquiry Web site for the teacher edition of this activity. There are many more activities like this at the Target Inquiry site. Please register as a user so that they may track use of their labs. There is no charge to use their site. Students who demonstrate understanding can develop and use models to illustrate that energy at the macroscopic scale can be accounted for as a combination of energy associated with the motions of particles (objects) and energy associated with the relative position of particles (objects). Examples of phenomena at the macroscopic scale could include the conversion of kinetic energy to thermal energy, the energy stored due to position of an object above the earth, and the energy stored between two electrically-charged plates. Examples of models could include diagrams, drawings, descriptions, and computer simulations. Does anyone else have trouble getting voltages close to the published values for electrochemical cells? I know the temperature may not be exactly 25 degrees C, but we are using 1M solutions and getting values nowhere close to what they should be. I, too, have had that experience. I did a coulple things, and it cleared things up quite a bit. I found out that my mulitmeters were a bit old. I tried the physics teacher's multimeters. Still got funky voltages. So then I tried polishing the metals that I was using in the lab. That was the trick. So I would recommend that you make sure the metal you're using in the lab is fresh and pollished. Hope it helps. Let me know! Target Inquiry Team activity has greatly helped kids to have a better insight into what is the scientific basis of various experiments and events . I loved making a read out of it . iT was very much interesting for me. If you want to achieve a change in mass during a class period, polish the electrodes before using them and disconnect the voltmeter after taking the initial voltage. If the time is short or you don't have very good balances, you might consider leaving one running for a longer time and share the measurements with students the next day OR just leave it running over night if you can afford to have an electrode eaten up. We really just want students to see that one is gaining mass while the other is losing mass and be able to discuss that in terms of transfer of electrons. I am always looking to make improvements, so don't hesitate to send comments!